The K-4RSM stores 4 / 16” (60 lb.) FCAW wire spools and is an economical choice for shops that need to centrally store their consumables for long-term, 24/7 moisture protection. Our K-4RSM model maintains welding rods at ideal temperatures to prevent moisture pick-up and to optimize welds. 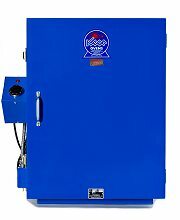 The K-4RSM has a solid steel construction for long product life and durability. 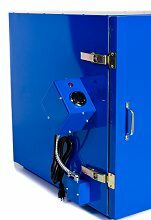 The exterior is powder-coated in KEEN blue and features a rugged door handle, tack-welded door hinges, heavy-duty storage shelves and 1" (2.54 cm) thermal insulating wool for energy-efficiency. 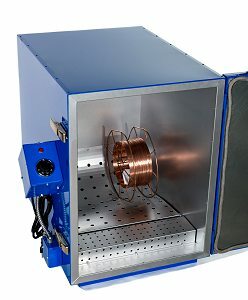 The K-4RSM features a long-lasting 500W Incoloy-sheathed tubular heating element for effective heating. An external dial-adjustable thermostat is standard equipment. An optional thermometer accessory is available for the K-4RS and is installed in the door (P/N 301127). The perforated, cradled shelving in the K-4RSM allows for natural convection within the oven and enables the spools to be supported on their sides without rolling out. The reinforced shelves are supported by a welded-in steel bar for stability and to prevent bending. Beneath the perforated shelves lies the tubular heating element, thus the spools are protected against contact with the heating element. With our shelving design, you can be assured that heat will reach your consumables safely and effectively and prevent atmospheric moisture contamination. Click here to learn about our custom shelving.